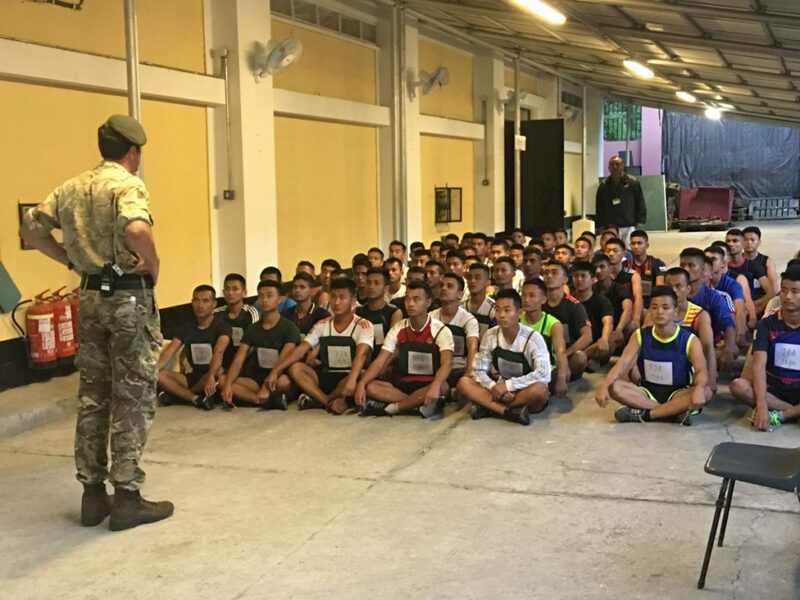 Regional Selection East for the Brigade of Gurkhas is currently in full swing. 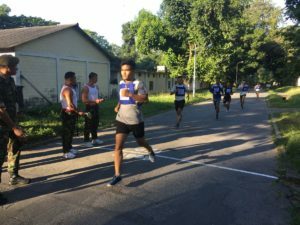 With the West phase (held in Pokhara) completed in August, the East selection is taking place in Dharan utilising the small MOD compound which was part of the old Gurkha Cantonment. Each day groups of potential recruits come from particular districts in turn, arriving early in the morning. Once all have attended they are drawn in an Order of Merit and the top group will join the top group from the west at Central Selection in Pokhara in January 2018 where the highest ranked 270 will be selected for training in the British Army. Once documentation is checked, a medical assessment takes place before the first test of a 800 metre run. This is followed by education tests to confirm potential recruits meet the minimum education standards. Then follow heaves, sit ups, jerry can carry and power bag lifts (the last two being introduced this year). Other checks included colour blindness and eye sight. The final action is an interview in Nepali and English. The staff for this huge task, which takes place daily over a three week period, are provided by British Gurkhas Nepal and are augmented by officers and soldiers from the serving Brigade of Gurkhas. A very strong assurance process exists. While tests take place the recording is double checked by a separate member of staff and all records are checked again before finalising. No member of staff is able to effect an outcome on their own. Once the Regional Selection East is complete then results by potential recruit number are placed on the MOD website explaining who is selected for Central Selection. As part of the assurance process this year Colonel James Robinson, Colonel Brigade of Gurkhas, visited 3rd to 5th November. He was accompanied by Brigadier Nick Fitzgerald who, as Director Operations in Army Recruiting, is responsible for recruiting standards was present to ensure the new tests were implemented and carried out fairly. The MOD website which explains the Gurkha recruiting criteria for joining, tests and process.